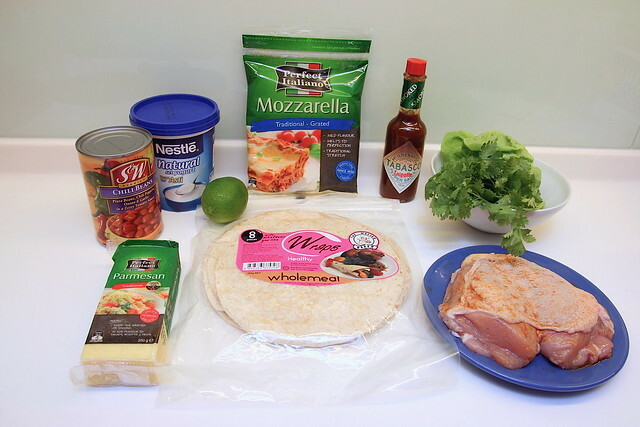 Most quesadilla recipes don't call for Mozzarella, but the Perfect Italiano Mozzarella here gives a nice stretchy and stringy effect. Adds to the fun experience, don't you think? I'd put Mozzarella in anything baked and cheesy. And because it comes already grated, it's really convenient. Use as much as you like, and you can store the remainder easily as the packaging comes with a "ziplock" feature. The Perfect Italiano Parmesan adds a bold salty kick to complement the Mozzarella's mildness. Both are versatile on their own or used in combination. 1. 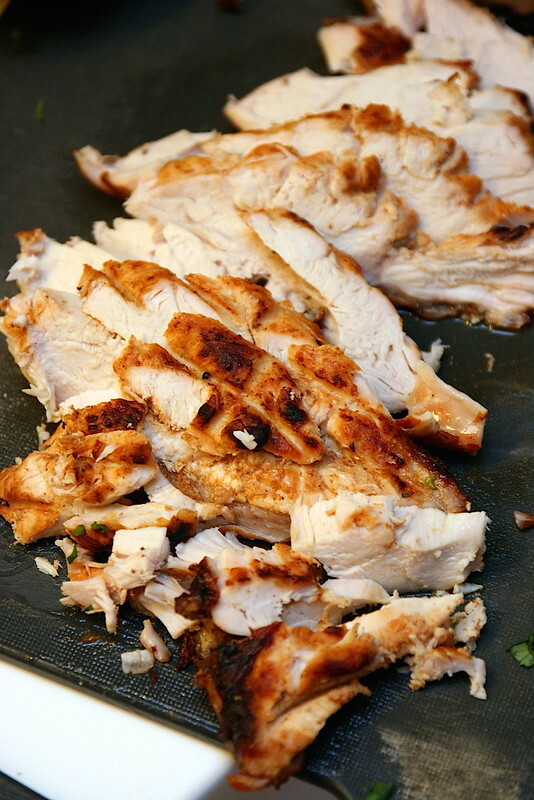 Marinate chicken for half an hour or overnight (that's best). Grill them in the oven until nicely browned. Slice when cool. 2. Lightly butter the wraps and toast it on one side in a non-stick pan (I love my new ceramic pans from ToTT!). You can toast them as full or half moon slices (I was playing around to see what was best). Leave one side untoasted (that will be the side you toast after you put in the ingredients). For extra crisp results, use the toasted side as the inner side where you lay the ingredients. 3. 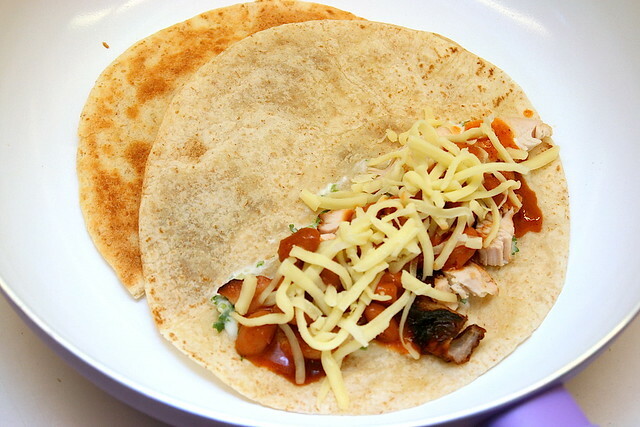 Lay out the dressing, chicken breast slices, beans, cheeses, and a dash of the Tabasco chipotle pepper sauce. 4. 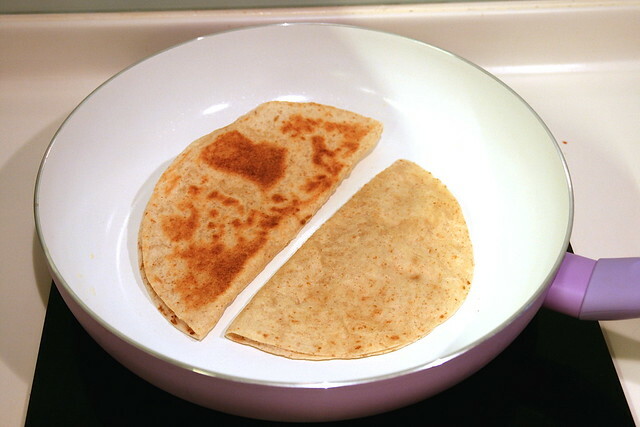 Put the wrap with ingredients back into the pan for toasting (the untoasted side) on medium heat. 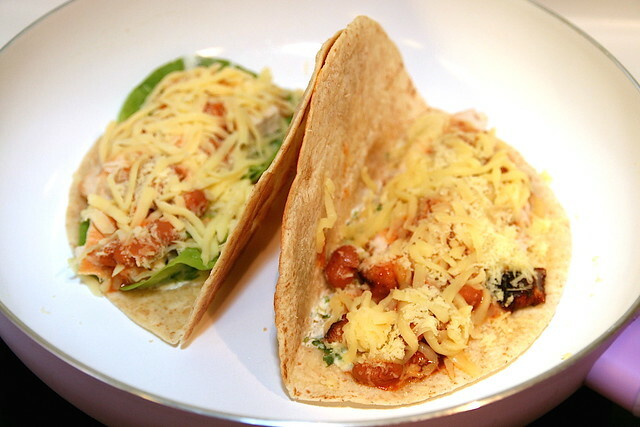 Fold them over and let the ingredients melt into each other. You can place a plate on top of the wraps to hold them down. 5. Flip them over if you need to, but they should be done in less than two minutes. Be careful not to let the wraps burn! Use a spatula to check the underside from time to time. Well that's your cheese snack all ready to eat! 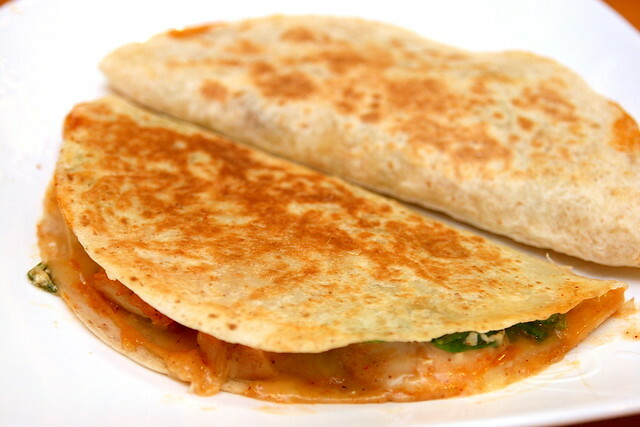 The half moon pockets are fun for kids as well, and they like the crispy cover as much as the melty cheesy mix inside. Feel free to come up with your own mix of ingredients - guacamole, red peppers, olives and tomatoes are common. You could even try a cheesy sambal ikan bilis version! Here is the printable recipe (click to view full size image), which you can also save offline. Check out my other recipe, using both these cheeses - the Garlicky Spinach Potato Gratin! 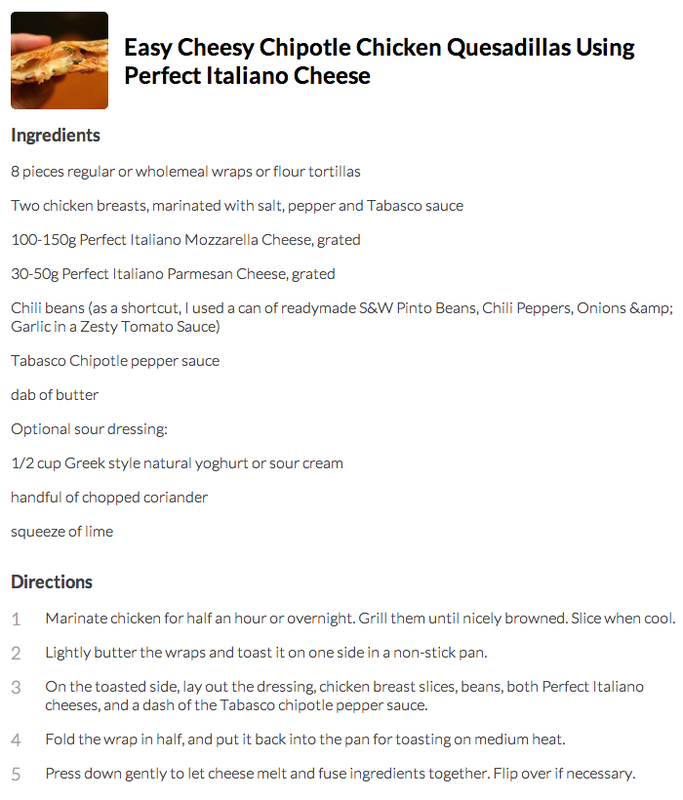 Meanwhile, check out other recipes from Perfect Italiano, which also has other products like Perfect Bakes and Pizza Plus cheese mixes. Looks like something even the kids will enjoy, I'll have to try it, thanks for the recipe!